Atta is a genus of New World ants of the subfamily Myrmicinae. It contains at least 17 known species. Leaf-cutter ants are relatively large, rusty red or brown in colour, and have a spiny body and long legs. The three main castes within a nest are the queen, worker and soldier. Only the queens and males have wings, and these ants are also known as 'reproductives' or 'swarmers'. Although most of the ants in the nest are female, only the queens produce eggs. Queens are usually over 20 mm long. Ants of the genus Atta are leafcutter ants that comprise one of the two genera of leafcutting ants within the tribe Attini, along with Acromyrmex. Atta exhibits a high degree of polymorphism, with four castes being present in established colonies: minims (or 'garden ants'), minors, mediae, and majors (also called soldiers or dinergates). The high degree of polymorphism in this genus is also suggestive of its high degree of advancement. Every caste has a specific function, and some remarkably advanced phenomena have been observed in Atta species. 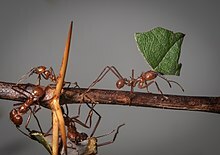 An example of such is the behaviour of the minim ants, which climb on the cut sections of leaf while they are carried back to the nest by the media workers to protect the latter from a particular species of phorid fly that parasitises the leaf-carrying caste. While hitchhiking, the minims also work to decontaminate the fragment before it arrives at the nest, and feed on the sap of the leaf. That the minims behave in this way demonstrates the highly derived character of the species. Like Acromyrmex, Atta subsists mostly on a particular species of fungus that it cultivates on a medium of masticated leaf tissue. This is the sole food of the queen and other colony members that remain in the nest. The media workers also gain subsistence from plant sap they ingest while physically cutting out sections of leaf from a variety of plants. Before leaving their parent colonies, winged females take a small section of fungus into their bucchal pouches, and with this, the subsequently wingless queens 'seed' the fungus gardens of incipient colonies, cutting and collecting the first few sections of leaf themselves. Atta has evolved to change food plants constantly, preventing a colony from completely stripping off leaves and thereby killing trees, thus avoiding negative biological feedback on account of their sheer numbers. However, this does not diminish the huge quantities of foliage they harvest; Atta is estimated for being responsible for the decomposition of 20% of all leaves in South America. Consequently, the genus is considered a major agricultural pest species in areas where its range coincides with farming activity. Workers of the genus have little cuticular bacteria. Leaf cutter ants are very specialized organisms in that they coevolved with another organism through symbiosis. This process took millions of years to occur, about 50 million years ago, which is when these ants began their relationship with fungi. The fungus eventually lost the ability to produce spores and the ants capitalized on that by making the fungus its main food source. About 66 million years ago, South America was isolated from other land masses, and this is when gardening ants started their relationship with a fungus. It has been hypothesized that leafcutter ants propagated the same fungal lineage for 25 million years, which means they caused the fungus to reproduce itself. The leafcutter ants are different from other ants by their underground fungi cultivation; they have not been thought to be derived from another ant, but they bear a resemblance to the harvester ant, Pogonomyrmex. Leafcutter ants can create bottom-up gaps by forming their large nests. The ants excavate soil rich in organic matter, and store additional organic matter in their underground chambers. This creates rich soils that promote plant growth. The ants can also trim the leaves of plants in the understory, allowing for more light to hit the forest floor. They can also control the types of trees and other plants by selectively bringing seeds into the underground chambers. Depending on the location of the chamber, a seed can grow by reaching light. Atta species are a popular ingredient in Mexican cuisine, particularly in the southern states such as Chiapas, Guerrero, Hidalgo, Puebla and Veracruz. It is considered a delicacy, as well as a food of high protein content, therefore it is often served as a main dish, not as garnish, despite its small portions. They may be eaten as the sole filling in tacos. The Atta, the type of ant most eaten in Mexico, has a nutty flavor. Many Atta species are also eaten in some regions of Brazil. Called tanajuras or içás, the queens are considered a delicacy and the techniques involving their capture and cooking are considered an immaterial patrimony of the people of the Tianguá municipality, in Ceará. Atta is also eaten by the Guanes tribe. ^ Bolton, B. (2014). "Atta". AntCat. Retrieved 20 July 2014. ^ "Natural History Museum". Archived from the original on 6 October 2011. Retrieved 2 February 2015. ^ Vieira-Neto, E. H. M.; F. M. Mundim; H. L. Vasconcelos (2006). "Hitchhiking behaviour in leafcutter ants: An experimental evaluation of three hypotheses". Insectes Sociaux. 53 (3): 326–332. doi:10.1007/s00040-006-0876-7. ^ Littledyke, M.; J. M. Cherrett (1976). "Direct ingestion of plant sap from cut leaves by leafcutting ants Atta cephalotes (L.) and Acromyrmex octospinosus". Bulletin of Entomological Research. 66 (2): 205–217. doi:10.1017/s0007485300006647. ^ Birer, Caroline; Tysklind, Niklas; Zinger, Lucie; Duplais, Christophe (November 2017). "Comparative analysis of DNA extraction methods to study the body surface microbiota of insects: A case study with ant cuticular bacteria". Molecular Ecology Resources. 17 (6): e34–e45. doi:10.1111/1755-0998.12688. ISSN 1755-0998. PMID 28477337. ^ a b c Hoyt, Erich. 1996. The Earth Dwellers. Simon & Schuster. New York. ^ a b Alejandro G. Farji-Brener, A. E. (2000). Do Leaf-Cutting Ant Nests make "bottom-up gaps in Neotropical forests? a critical review of evidence". Ecology Letters, 219-227. Wikimedia Commons has media related to Atta.